Many gamers see the film industry as the premier model that video games should follow, and it's no surprise. Movies are seen as the most legitimate and profitable of all artistic visual mediums, which is certainly qualities practitioners of any new medium would desire. 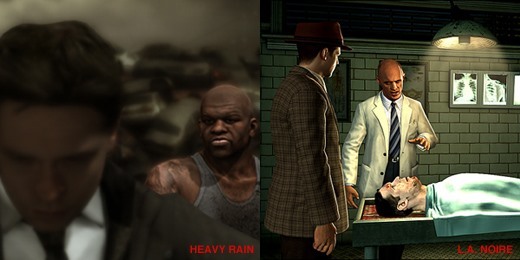 Big budget games like Heavy Rain and L.A. Noire strive for the same level as film by aping its techniques, focusing on storytelling in a cinematic fashion, rather than creating compelling gameplay experiences. Social game developer Alexis Kennedy highlighted this point yesterday, speaking before a panel at the Develop Conference regarding narrative in games (his specialty). He blasted the two games above, as well as others, for trying to turn video games into movies, though he put it much more colorfully, stating that games attempting to mimic film techniques "end up looking like the inverted baboon that came out of the teleporter in The Fly". "Story in games so far has been whether your character dies or not. Heavy Rain is still about whether your character dies or not. I cannot think of a less interesting thing to do with a story than cut off parts of it as you go on." These comments were a little yellow, but Kennedy knows what he's talking about. 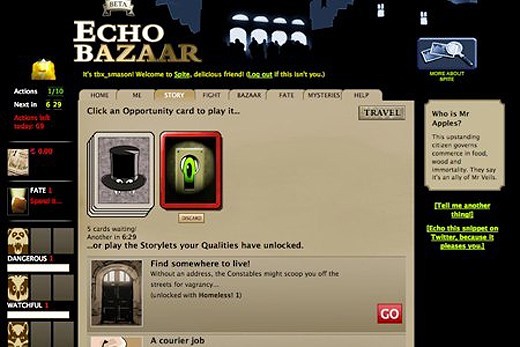 His best-known work is the browser game Echo Bazaar, a sort of choose-your-own-adventure card-based adventure game with Facebook/Twitter connectivity and microtransactions. It's really fun, and has a very free-form narrative structure that could only work in a video game. His company Failbetter Games has also done some consulting and contract work for big-name companies, from Bioware to BBC4, so they clearly have a good reputation. Echo Bazaar is entirely text-based. While it works well for flexible storytelling, it also leads to boring screenshots like this one. Kennedy isn't the only person talking about this either. Will Wright has extolled the virtues of emergent gameplay vs. narrative storytelling in games, and his Sim titles are great examples of how games can tell stories in a way entirely distinct from film. When most gamers talk to their friends about games, it's not events from the narrative they describe, but narratives that happened to them while they were playing the game. These organically generated tales of heroism are the exclusive purview of the video game experience. 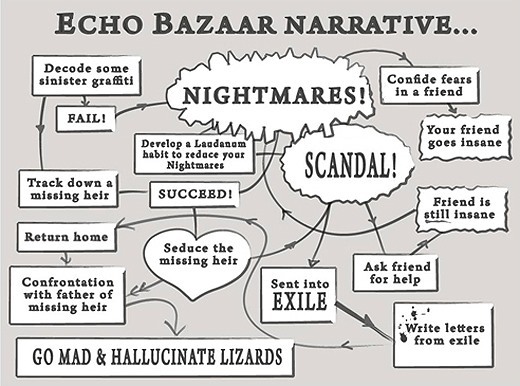 Failbetter's attempt to quantify the narrative structure of Echo Bazaar. This is not to say that video games shouldn't have narrative plots. I love JRPGs... and they are some of the most plot-heavy games in the world. But it would be nice to see AAA developers put more effort into developing the inherent strengths of video games instead of just trying to make interactive movies with substandard CGI.